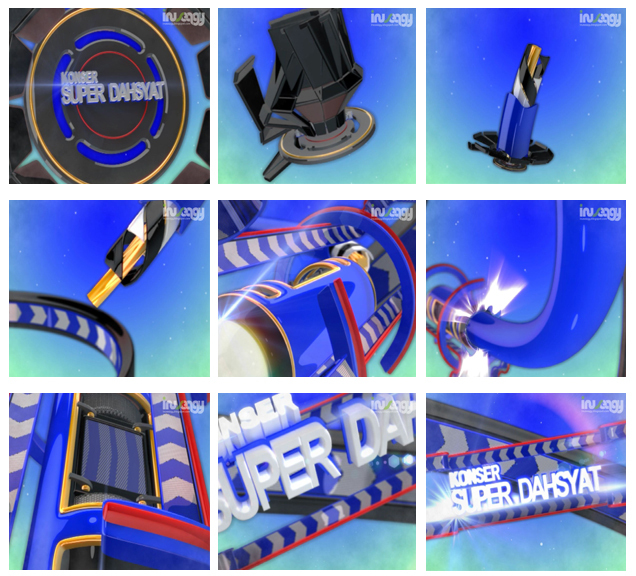 Bumper for opening music concert "Super Dahsyat". It was held in RCTI TV, May 2012. In the most of animation projects, I prefer use lowpoly model than high poly (of course!) even in a non-character animation. The reason is, the capability to accelerate your current work in animation stage process. After modeling phase is done, make sure give them the appropriate name which should be categorized by 'mesh, helper, spline, or bone'. It's all can help you later in the next processes, such as importing, selecting, skining and other's stage. Then, make sure to link/ parent the mesh selected to the helper or controller. In other words, we currently animate that helper or controller, not the mesh. It is to avoid the unexpected deformation. There's a variety way on modeling in 3dsmax, such as by make polygon, combination of spline and shape, lofting, etc.. it's up to you. But, make sure to collapse all the modifier (such as symmetry, bend, ) to be one list object (editable poly). I suggest you this way in order to access that mesh lighter . The objects seem like loudspeaker arranged with some box mesh deformation which linked to the helper. I just move one stick, then copy them using "Array" and make sure makes different time in animating each other to get dynamic impression. Unfortunately, in 3dsmax we'll take a minute to do that, we've to actually copy the mesh. In contrast to Cinema 4D which provide the effector called "Cloner". The object "Twist cables" are made using a combination of mesh extruded and modifiers. The first modifier is "Extrude" it self, a closed spline was. Then we twist the mesh using modifier "Twist" and last we crooked it with "Bend". Simple way, is it not! In this case, i use V-Ray rendering engine. The setting is, GI (Global Ilumination) and reflection active of course. I choose to accelerate rendering in low profile mode, the consequence is the declining quality. In element of rendering, add zdepth, reflection and color of flat wire. Zdepth used to add more accurately amount of blur. In the after effects CS5, we use this zdepth in the filter option 'Lensblur'. While the reflection becomes an additional option to refine the object of reflection, you can change the mode of layer to get appropriate results. Finally, the color of flat wire is used to facilitate selection when adding a certain effect. This combination of render element will make a beautiful composition. Thank's.